I'm a cheapskate, I have an old caravan of little value, there's no way I'm going to pay out to insure it for theft or damage, it's worth so little, I'm happy to take a chance, the legal minimum is covered by my motor policy, which covers accidental damage to third parties, when towing a trailer, which my caravan is. If I reverse or maneuver my caravan when attached to the towing vehicle and cause damage to a third parties property, presumably I'm covered. If I detach my caravan and use the mover and cause damage, presumably I'm not. Does anyone know of any incidents where this scenario has been relevant? Yes. My son had a caravan. He was moving it by hand when it ran away and damaged a neighbour's car parked nearby. The car owner claimed for the damage in his own car insurance. Presumably your son's neighbour claimed on his insurance based on the premise that he didn't know the identity of the responsible party, ie you son, who would be liable if what you say is correct. The insurer would then be able to claim the cost of repairs from your son, if they chose. And if it was my car I would have been expecting your sun to pay and if not would have used my legal cover to make redress unless I was feeling really benevolent. I have heard of a couple of caravans running down hills when being unhitched but I would think is the highest risk is fire and damage to surrounding cars and caravans and awnings and you will need deep pockets . Compared with manual manoeuvering it's less likely that damage will be caused if a mover is deployed. And in fact a mover will also prevent a van running away downhill. I don't know. For such a relatively small amount I am not sure the insurance company would bother. Why would you be doing that? Your insurer would have been dealing with it. Your "legal cover" is not a fund at your disposal and they would not want to embark on a crusade for a small amount. Your feelings of benevolence would be irrelevant. I suppose you would be liable, but if you had home and contents insurance, you MAY have cover under that. Are you covered for liability if you cause an incident in the street whilst walking along? Probably not, so be careful, or be prepared to pay. Yes but they don't get paid out by request. They have to make a claim and prove negligence of some kind. The reality is that they do not chase after small claims. Why would I be doing that? Simply because otherwise I would be significantly out of pocket. Where that to prove the case then I would do what I have previously done. Claim on my insurance and then use the legal cover to recover the money lost through my excess, loss of no claims, any increased insurance costs and provision for a hire car during repair. my little boy/girl has bumped into a caravan "A" frame while riding the bike, can I claim, or, my little boy girl has bumped into a window and cut her face, can I claim. Location:Weymouth on the sunny south coast. Interests:Enjoying life to the max! If a caravan is attached to a towing vehicle then, under U.K. law it is deemed to be an integral part of the towing vehicle, hence, under those circumstances, the third party (only) part of the towing vehicles insurance covers it. The instant it is detached from the towing vehicle a caravan (obviously) can no longer be considered an integral part of it, so the towing vehicles insurance no longer covers it. So to answer the original question you are not covered by the towing vehicles insurance from the moment it’s detached. If an uninsured and unhitched caravan caused damage to my property there is no way I would claim off MY insurance. I would pursue the owner of the “offending” caravan because any claim I make will affect my future insurance costs. Under NO circumstances will the insurance of the towing vehicle ever cover damage to the towed caravan, it only ever covers third party injury or damage. Just a note for anyone touring the Continent with a caravan insured only for third party claims through the car's insurance policy, it would be illegal to separate car and caravan on a public road over there. As long as the caravan is on a public road it must have third party coverage whether hitched or not. Also, the third party will always claim directly against the owner of the caravan or his insurance and, in order not to lose his no-claims bonus, not even inform his own insurance of the accident. My first old caravan cost £60 a year to insure with a value of what I paid, £1400 if yours is worth less then the premium will likely be a bit less, is it really worth not insuring it for what is a fiver a month.. The car owner claimed for the damage in his own car insurance. Your son's neighbour must be "one in a million". There's no way I would hand a similar claim to my car insurers. For a start, I'd have to stump up the first £350 myself since that is a condition of the policy. Then although my no-claim bonus is protected, I could look forward to a hike when renewal time came around. I'm afraid I'd be looking for a different solution. 1. Can I afford to instantly replace the item without financial pain? If the answer to BOTH is yes then I don’t bother to insure, otherwise it’s a no brainer. If I or my caravan when attached to the towing vehicle and cause damage to a third property, presumably I'm covered. If I detach my caravan and use the mover and cause damage, presumably I'm not. I know of two incidents, one I witnessed the other I inspected the damage, both could have so easily hurt somebody or worse and the claims from doing that could be life changing. One at a rally a caravan was being manhandled, when noticed it start to roll away backwards down a slope gathering way. One individual put the handbrake on but far from fully enough and total control was lost. Fortunately it hit no one or no other property. If some kids were downhill it could have been exceedingly tragic. 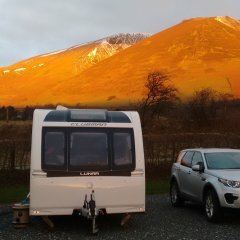 The other was on collecting a caravan I saw a lovely new Castleton with stoved in rear end. I was told that it had been left on a sloping drive and some time later simply rolled away into something very hard. All only pocket money relative to hurting somebody, that comes very expensive indeed. The only consideration you've omitted is the probability of an incident occurring, if likely incidents are common, then it's worth paying a large premium, if the likelihood of an incident occurring is extremely small, then it's a tiny risk if you don't insure. The above incidents you mention are all due to carelessness or plain stupidity, if one is attentive when maneuvering on site, risks of damage to third parties is extremely low. I suppose that the reason we are not legally obliged to have third party insurance for caravans is that there is no legal requirement for caravan registration. That is the difference between the UK and Europe. Not quite. Some vehicles which do not have to be registered on the Continent but nevertheless used on a public road still have to be covered by third party insurance. Examples are disability scooters capable of more than 6km/h, other scooters and e-bikes capable of more than 25km/h. Although an accident may be low down on the list of probabilities, the risk of fire is higher. If the caravan catches fire and damages third party property, this could work out to be very expensive for the owner of the caravan. Indeed, it’s all down to what level of risk an individual is prepared to accept. Yet again you are I deed correct, but no-one ever intends to have any sort of incident, but they DO happen and none of knows when or where. Have you never cut yourself or broken a bone? I bet it was unintentional wasn’t it? ?